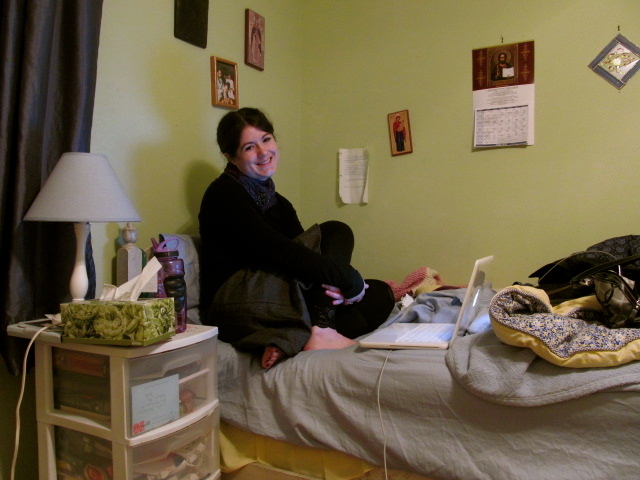 I haven’t blogged in three weeks. And I realized that the longer it’s been, the harder it gets to come back to it. Real life is wearing me out. And if you’re wondering where I’ve been, I’ve been here, living my life. I’ve been teaching and sewing and knitting and drinking tea (Have I mentioned how much I love this place? Or this one?) and coffee and reading and living. 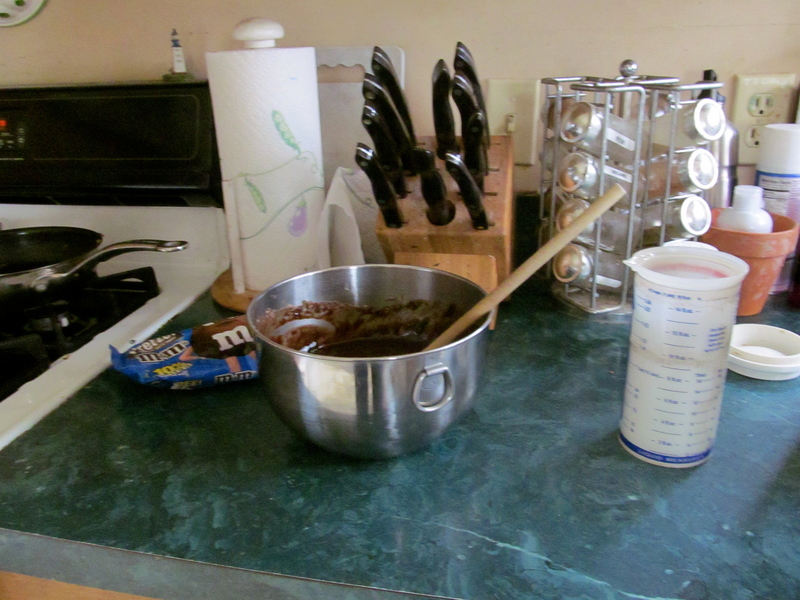 Well, Saturday, it was some days, you just need to make brownies with pretzel M&Ms in them. But they are super delicious. Trust me. 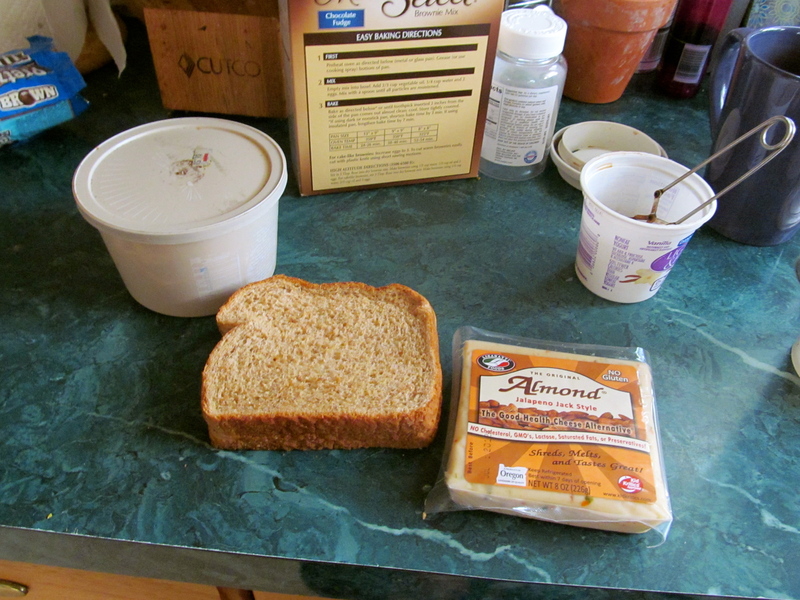 Of course, Saturday was also the day of “some days, you just have to make a dairy-free grilled cheese sandwich. Thankfully, Whole Foods sells almond cheese, which is delicious. The really great thing about the Lisanetti cheese is that each chunk is enough cheese for me to make three sandwiches. And I love grilled cheese. It’s probably the thing I miss the most in my dairy-free life. Sure, I miss ice cream, but there’s always sorbet. And I rarely find myself missing mac and cheese. And I have some great dairy-free tuna noodle casserole recipes. 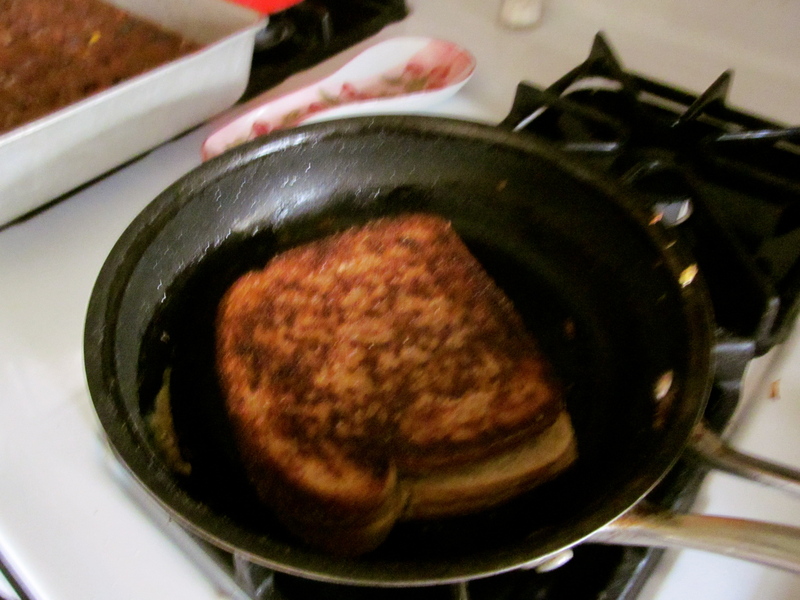 But I miss grilled cheese sandwiches. And then I found Lisanetti at Whole Foods. It’s more expensive than cow cheese, but every now and then it’s a great treat. Like I said, I’ve also being doing some sewing. Saturday, I spent the day working on a dress that I’ve been plotting since August. I bought the pattern and fabric in August. I cut the pattern and material out in October. 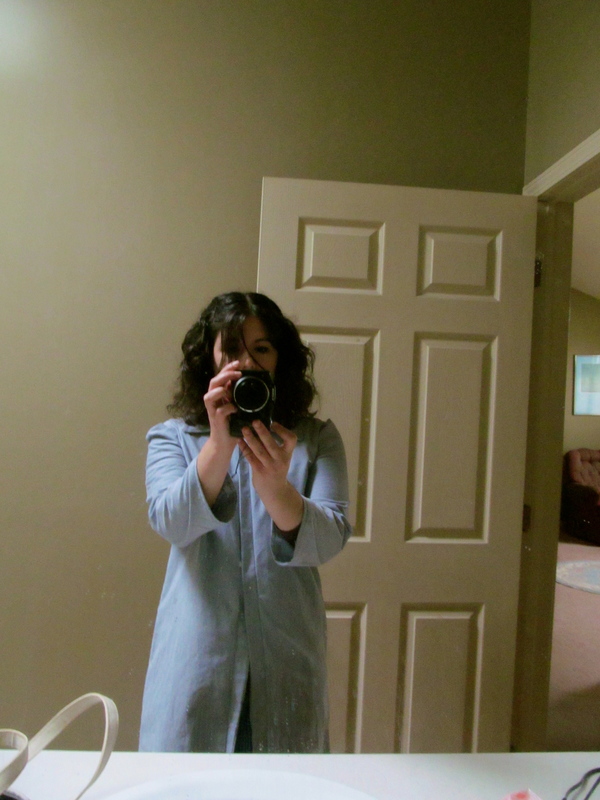 (Side note: That blue dress that I blogged about back in October is uber-popular. People ask me where I bought it and how they can get one. Yesterday, someone even told me I should try to sell them. But then, it is an awesome dress.) Back then, I thought I’d have the thing done by the end of the month and I’d be wearing it all over the place all fall/winter. Well, umm, that never happened. I lost steam on it. I lost interest in it. I neglected it for other projects. And it just sat in my bedroom until Saturday. Saturday, I got home from running errands around two in the afternoon, sat down at the sewing machine and set to work. This is what I had by six o’clock. I know it’s hard to tell from the picture, but the dress is almost done. All it needs are buttonholes and buttons. I own the buttons. I have a mother who is planning on teaching me how to use the buttonhole feature on her sewing machine on Saturday. In other words, dudes, I shall have a finished dress by Sunday. And yes, I know that it currently looks like a lab coat. The picture is over a week old and the project is much larger now. 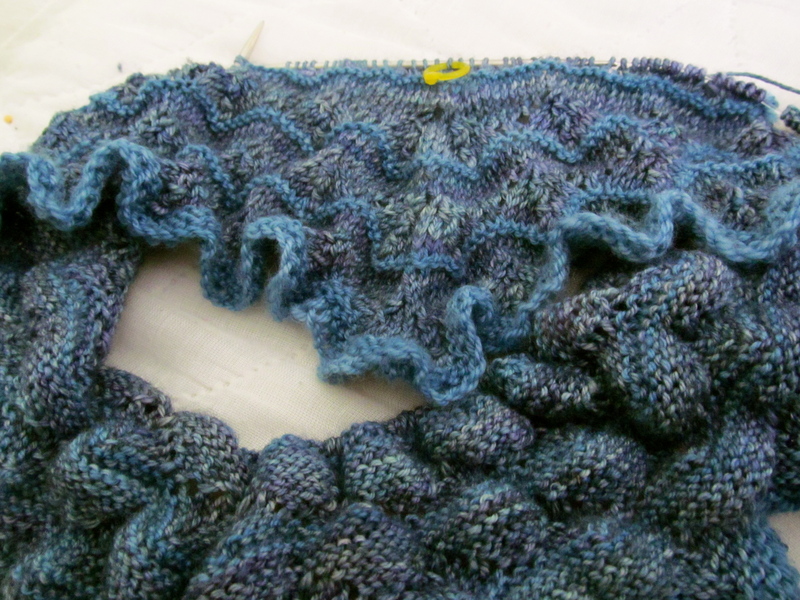 It’s an Abalone sweater that will be a friend’s birthday present. I’m adding some colorwork to the bottom and the chest…and the sleeves, which will also be altered/added…mostly because, well, I can. I figured out how to do it, so I decided to take some advice from Nike and just do it. And now, I’m going to check on my bread and get back to my real life. In today’s post, I’m going to show off two finished objects and one work-in-progress. 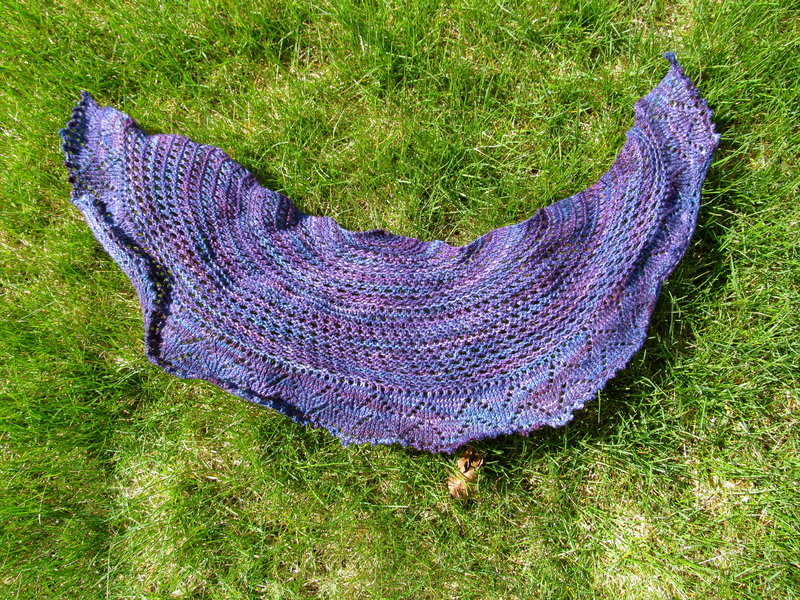 We’ll start with my Afternoon Tea shawl that I finished about two weeks ago. The first picture is me wearing it Friday night after church. The second I took in the backyard this afternoon. The second finished object is my Magrathea shawl. Magrathea is a planet mentioned in Douglas Adams’ The Hitchhiker’s Guide to the Galaxy. 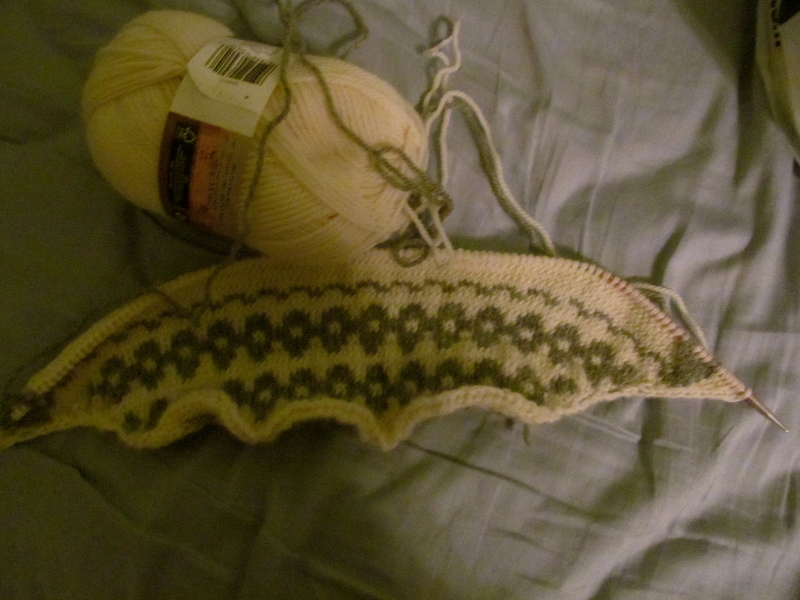 The shawl pattern is written entirely in charts, which was a new experience for me, but it was a good one. And the finished object is gorgeous. 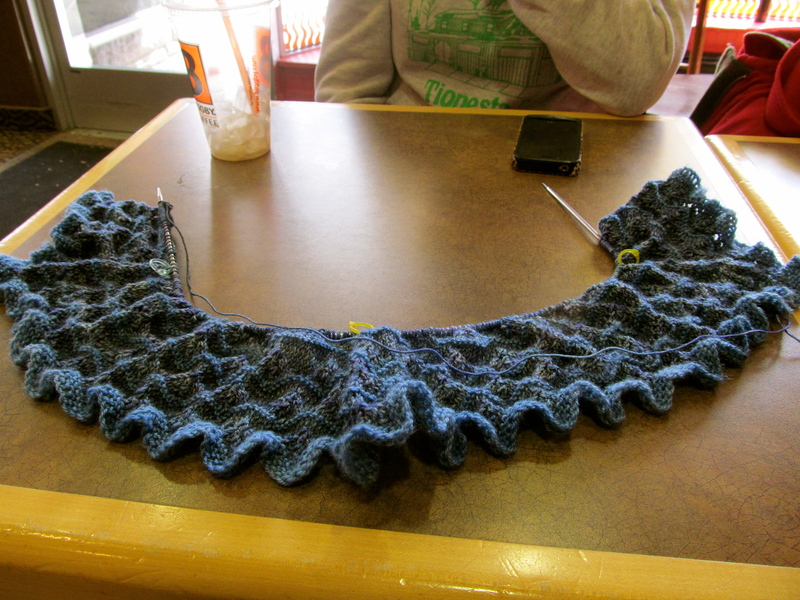 This afternoon, I went out for coffee with Becky and made use of her wonderful photography skills (and my awesome camera) to get a couple of modeled shots of the shawl. And yes, I was drinking coffee while she took my picture. 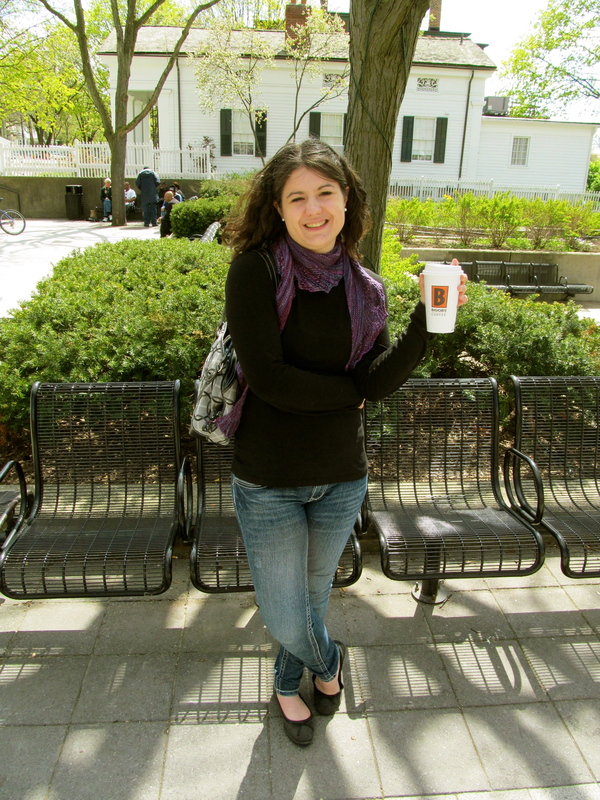 I was enjoying an Irish cream latte from Biggby. Let me tell you; I do love their Irish cream lattes. When I got home, I took a picture of Magrathea and Afternoon Tea next to each other. I mentioned a few weeks ago that the two shawls are made from the same yarn (Malabrigo sock, yum!) and the same colorway (Abril) but being from different dye-lots, they are very different shades of the same colors. 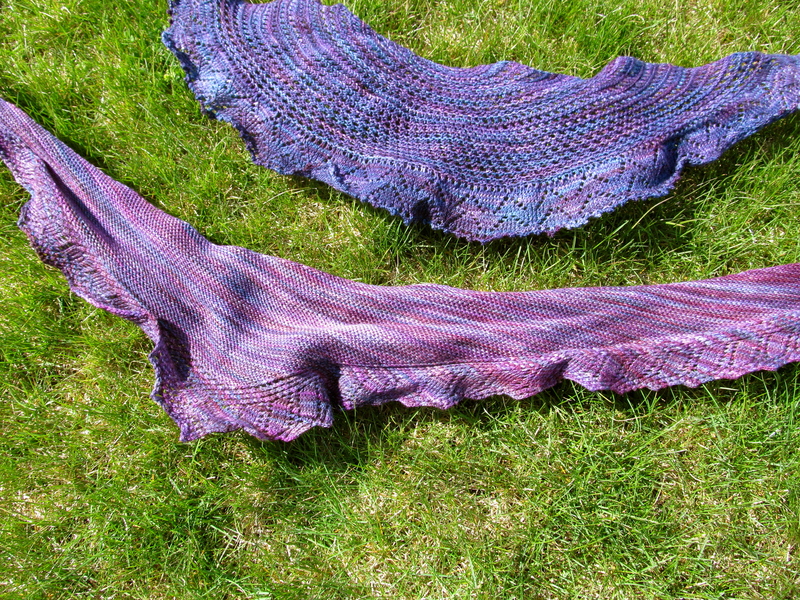 I love both shawls, but the variance between them is astonishing. And now for that WIP…I’m working on this project as a test knit, so I can’t release any details to you, but I can show you a few sneak-peaks of something gorgeous. I’m not sure why but this reminds me of peacock feathers. And I’m very excited about it. For much of my life, my mom has joked that during Holy Week our family should just move into our church for all the time we will spend there. We should just pack up duffel bags and sleeping bags on Wednesday and camp out there until Sunday around noon. We spend a lot of time at church. A whole freaking heapload. And we spend about an hour in the car round-trip going to and from church. And while driving to and from church and then being there for at least two hours a day is tiring, it’s also good. And it’s not something I would trade for the world. This week is Holy Week for Christians who follow the Gregorian Calendar. (Those on the Julian Calendar will celebrate it next week.) It is the week when we celebrate and remember Jesus’ triumphal entry into Jerusalem on the back of a donkey, His Last Supper with his disciples during which my Catholic faith believes he instituted the Eucharist and the priesthood, His saving Passion and death on a crucifix, and His Resurrection from the dead three days later. It is the week when I am reminded year after year why I am Catholic. I grew up in a devoutly Byzantine Catholic home. I went to Roman Catholic schools from first through twelfth grades. I have, since age seven, gone to Confession during Advent and Lent every year. I only ever miss Liturgy/Mass due to traveling or illness. Heck, I wear a chapel veil during Liturgy every Sunday. On paper, I’m a good Catholic. But I’m not saying this to be praised. I’m really not because in spite of all of this (or maybe even because of it) I don’t feel like a good Catholic by the time Holy Week rolls around. I’m never sure that I’m really ready for Easter. See, here’s the thing. If I were to miss fulfilling my Sunday obligation, I’d feel bad about it. And I’d definitely go to Confession for it. But I’m not always sure that’s because I’ve really internalized my faith. That’s because twelve years of Catholic education has infused me with a strong sense of Catholic guilt. And that’s not something I’m proud of. I love being Catholic. I really do. I am incredibly grateful that I was raised in a Catholic family and given the education and opportunities that I have received. But there are times when I question whether or not I’ve really internalized and claimed my faith for myself. Do I really believe that Jesus Christ is the Son of God? Do I really believe that on the night before he suffered he took bread and wine and transformed them into His Body and Blood? Do I really believe that during that same meal he instituted the priesthood and left His Apostles to carry on His Church? Do I really believe that when he was beaten and whipped and spat upon and crucified he did it for me? Do I really believe that three days later he rose from the dead? Do I believe that he ascended into heaven after promising his apostles the coming of the Holy Spirit? Do I really believe that he sent that Holy Spirit? Do I really believe that he has given his Church Saints to guide us for the past 2000 years? And do I really believe that he is coming back again someday to judge the living and the dead? Do? believe in one, holy, catholic, and apostolic Church? Do I accept the remission of sins and the resurrection of the body and the life of the world to come? When it’s put like that, yes. I can look at that (very long) paragraph and say that I do believe that. But I don’t always act like it. And that is something that I need to work on. As a priest said in a homily I heard a little over a week ago, Lent is a time to grow closer to Christ, to become more like Christ. And that’s where I struggle because Lent isn’t just about doing things. It’s about becoming someone. This year, it took me until the day before Lent began to figure out how I wanted to focus more intently on God; I just couldn’t come up with any ideas that seemed like they were “good enough.” And every year before Lent, I don’t get excited about fasting or prayer; I get mopey about how long Lent is. Forty days seems like such a long time to me. Until Palm Sunday. (NB: In the Eastern Church, Lent ends the Friday before Palm Sunday.) Then forty days have gone by in a flash and I don’t know how it’s happened and I haven’t come as far as I should have. And I never feel as changed as I might want to feel. I never feel like I’m really doing a great job of being a follower of Christ. This Lent, I’ve looked around myself and seen people who are doing a “better job” than me. Sure, I’ve gone to church every Sunday-and almost every Friday. I went to Confession. I read a book by the Pope. I pray daily. I even have a Lenten themed playlist on my iPod. But I still question if I’m really doing enough. Are my Lenten devotions really enough for Jesus or should I be doing something more so that I can grow closer to him? But as I reflect on this, I’m realizing something. My question isn’t really if I’m really doing enough. My question is really this: Am I really good enough for Jesus? Am I, Cecilia, a fallen human being who gets cranky and sassy and sarcastic, who doesn’t function well without coffee, who doesn’t like to get up before 8am, and who would rather not have to take a shower with less than perfect water pressure-is that person really good enough for Jesus? He hung on a cross for three hours and I get cranky-pants about people flushing the toilet while I’m in the shower. How could I ever be good enough for him? Answer: I can’t. I just can’t be. I’m a fallen human being, and nothing I can ever do will be good enough. So why should I keep making an effort every Lent? Why should I spend every Lent (and really every day of my life) trying to grow closer to Christ, trying to become more like Christ? St. Athanasius gets to answer that question for us. Two thousand years ago, God the Son became a human being in Bethlehem. In that moment, time met eternity. And for the next thirty-three years, Jesus lived and breathed as a human being. And then, at the feast of Passover, the Second Person of the Trinity became the ultimate sacrificial lamb. He was perfect, utterly without stain. And he laid down his life so that by his death, fallen humanity might be reconciled to God. Nothing I can do will ever equal that. But because of that, I am offered mercy and the forgiveness of sins. He humbled himself to become a human being, died for us, conquered and despoiled the grave, and then promised that one day we will reign with us in glory. He left us the Church, the Body of Christ. And as a Catholic, I believe that in that Church, he left us the Eucharist. Every time we repeat those sacred words of “This is My Body. This is My Blood” He becomes physically present to us. He isn’t just there in spirit. He is physically there. The Second Person of the Trinity is there. He transcends time and space and is really and truly there. And all of that, that is what we celebrate during Holy Week. We celebrate God’s greatest gift to us. So, why am I Catholic? Because this year, every year since I was in late high school, Holy Week has reminded me of all that God has done for His children-especially at the end of his earthly ministry. For three years, He traveled around, living simply while teaching and preaching about the Kingdom of God. He gave the blind their sight. He healed the lepers. He made the mute speak and the deaf hear. He raised the dead. And then, he entered Jerusalem as a king, on the back of a donkey. He celebrated the Passover with his friends one last time. And in doing so, he gave his Church two incredibly beautiful gifts-the Eucharist and the priesthood. And he became our Passover. He was the innocent lamb, the first-born son led to the slaughter so that we who were still sinners might go free. He paid the ransom. And then he gave us the gift of the Church. So no matter how grouchy or mopey or unmotivated I am, there is always grace available. All I have to do is accept it. And I have to remember that ultimately this is about me becoming more like Christ…and hopefully bringing some other people with me. But you won’t find me camping out in the back of the church this week. It’s too cold there, and the floors are too hard. Plus, I’m pretty sure my mom is expecting me to help her get ready for Easter dinner on Sunday. And I’m in. As long as she lets me listen Handel’s Messiah, but that’s another post.